Wash and grind ¼ cup poppy seeds in a food processor with 1 green chili and water. The paste will be thick, not watery. So, stop the processor in between and keep adding little amount of water. Blitz until smooth paste forms, keep aside. Make a paste of onion and 3 green chillis using the food processor, keep aside. Rub salt and turmeric powder on the freshly washed fish pieces. Heat 1/3 cup of oil in a kadai/deep frying pan and shallow fry the fish pieces until golden, care should be taken not to crisp fry them. Remove and keep aside. Transfer the remaining oil from the kadai (read note) in a bowl, you can use this oil on the same day for cooking fish. Heat 4 tbsp of fresh vegetable oil in the kadai, temper with green cardamoms & bay leaf. Next to add the onion+chilli paste, sauté until light brown in colour. Add ginger paste, fennel seeds powder, coriander powder and salt. Mix well and sauté for less than a minute over medium heat. Add coconut milk, mix well, cover and give it a quick boil over high heat. 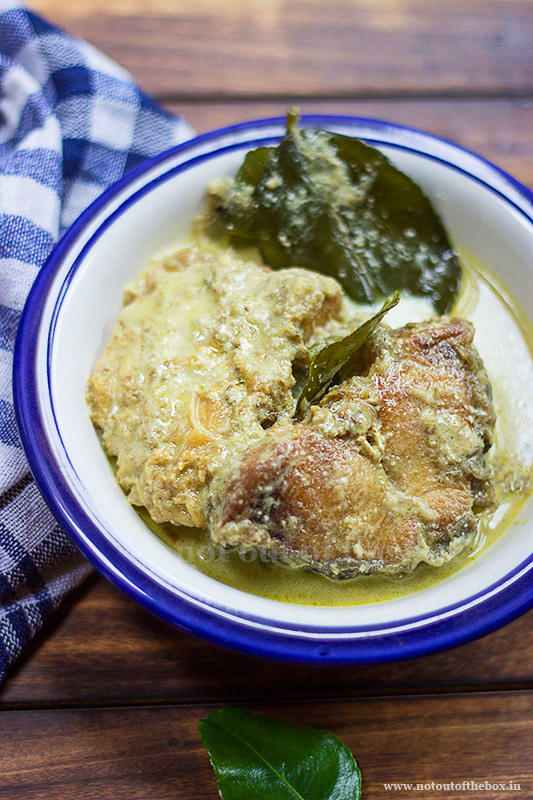 Once boils, lower the heat, add the fried fish pieces, lemon leaves and poppy seeds paste. Give it a gentle stir, cover and cook over low heat for 15 minutes or until the curry thickens. Check salt, add sugar at the end, and cook uncovered for 2-3 minutes more. Your Lebupata Mach is done. Serve hot with steamed rice. I didn’t use the remaining oil for making the fish curry because the colour of turmeric powder got infused in the oil while frying the fish pieces. I didn’t add turmeric powder in this fish curry because the ivory colour complimented the subtle taste of the curry beautifully. 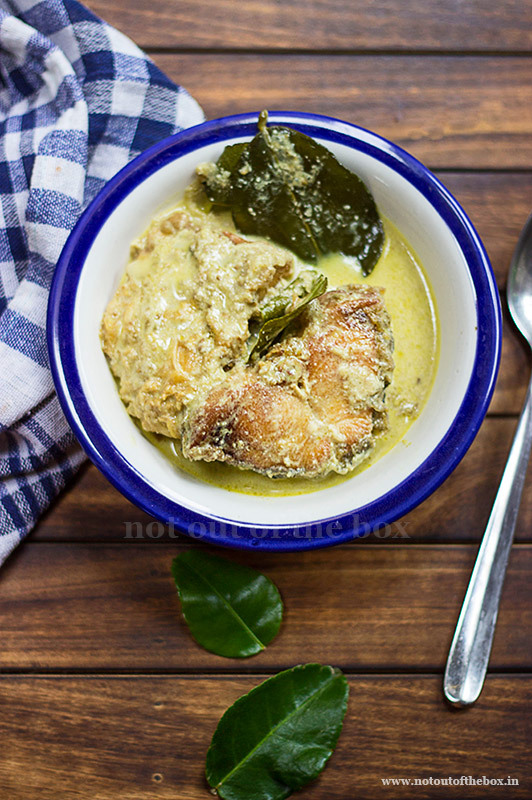 This fish curry can be made with any freshwater fishes and Prawns.